Part I: Fundamentals of Pool. Chapter 1: Arriving at the Pool Party. Chapter 2: Getting Down: Building a Solid Stance. Chapter 3: Handling the Cue. Chapter 4: On Target: The Science and Feel of Aiming. Chapter 5: Hit It: Creating a Solid Stroke. Chapter 6: Playing Nice: The Etiquette of the Game. Part II: Controlling the Cue Ball. 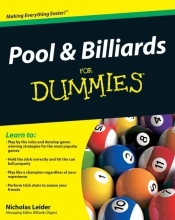 Chapter 7: Getting Control and Stopping the Cue Ball. Chapter 8: Aim High: Incorporating Follow. Chapter 9: Using Draw: Putting Backspin on the Cue Ball. Chapter 10: The English Effect: Using Sidespin on the Cue Ball. Part III: Taking Your Shots. Chapter 11: Opening Shots: The Rack and the Break. Chapter 12: Thinking Ahead: Position and Pattern Play. Chapter 13: Shot making: Tackling the Most Frequent Situations. Chapter 14: Eying Combinations: Making Shots with Multiple Balls. Chapter 15: Billiards and Caroms: Finding New Ways to Pocket Balls. Chapter 16: Banks and Kicks: Making the Most of the Rails. Chapter 17: Thinking Defensively: Playing Safe. Part IV: The Games You ll Play. Chapter 18: The Magic of 8 Ball. Chapter 19: 9 Ball: The Hustler s Game. Chapter 20: Pool s Many Other Games. Chapter 21: Equipment Check: Looking for Quality Tools. Chapter 22: Pool Is Mental: Winning the Head Games. Chapter 23: Drilling It Home: Practice Techniques. Chapter 24: Mastering Ten Trick Shots. Chapter 25: Overcoming Ten or So Common Problems.